Not long after the 2016 presidential election, House Republicans entertained a rule change proposed by Reps. John Culberson (R-Texas), Mike Kelly (R-Pa.), Mike Rogers (R-Ala.), and Tom Rooney (R-Fla.) to bring back earmarks. The rule change, which likely would have passed if allowed to proceed, was quashed by Speaker Paul Ryan (R-Wis.), who felt that reviving the practice sent the wrong message after a “drain the swamp” election. Speaker Ryan did pledge, however, that the House Republican Conference would revisit the issue. At the time, he indicated that such a proposal would be considered in the spring. That time passed and the issue fell to the wayside as major legislative initiatives like health insurance reform and tax reform took center stage. Unfortunately, under the direction of Speaker Ryan, the House Rules Committee will conduct hearings the week of January 15 on bringing back the practice of earmarks. During a meeting with congressional leaders, President Donald Trump appeared to endorse the idea. He believes that earmarks will make passing legislation easier, a sentiment shared by many members of Congress. What is an earmark? It is a specific line item in a spending bill, such as an appropriations or transportation bill, for a project or program. 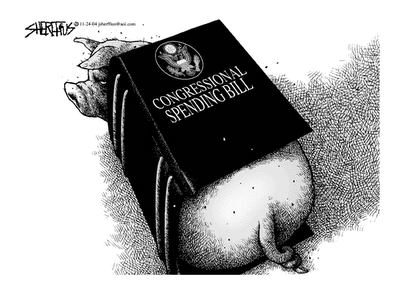 Earmarks may not necessarily always be pork-barrel spending, but they often meet the definition. Citizens Against Government Waste defines pork-barrel spending as meeting two of seven criteria, including not being competitively awarded, not being the subject of congressional hearings, and serving only a local interest or a special interest. Perhaps the most famous example of an earmark is the Gravina Island Bridge, more popularly known as the “bridge to nowhere.” The proposed bridge would have connected Ketchikan, Alaska to Gravina Island, Alaska, a sparsely populated island in the southeastern part of the state. The earmark for the Gravina Island Bridge was included in the Transportation, Treasury, Housing and Urban Development, the Judiciary, the District of Columbia, and Independent Agencies Appropriations Act. Sen. Tom Coburn (R-Okla.) targeted the earmark by offering an amendment for its removal, which was easily defeated on the Senate floor. Although Sen. Ted Stevens (R-Alaska) and Rep. Don Young (R-Alaska) fought to keep the earmark for the bridge in the bill, Alaska canceled the project in 2015. The fight to end earmarks began before the Gravina Island Bridge. In 2005, conservative and libertarian bloggers began shining light on earmarks, calling the movement “Porkbusters.” Some see Porkbusters as the spark that eventually led to the Tea Party movement. In 2006, the Jack Abramoff corruption scandal increased the scrutiny of earmarks. Abramoff, who was convicted, had dubbed the House Appropriations Committee the “favor factory.” Nearly two-dozen people involved in the scandal, including Abramoff and Rep. Bob Ney (R-Ohio) were convicted as a result of the corruption investigation. Separately, Rep. Duke Cunningham (R-Calif.) resigned his seat after admitting to taking bribes from defense contractors in exchange for earmarks. He was later convicted. Rep. Jerry Lewis (R-Calif.) also came under scrutiny after securing earmarks near the Eastern Market Metro Station, which increased the value of his Washington, D.C. home four blocks from the station. Rep. Jeff Flake (R-Ariz.) spearheaded the effort in the House of Representatives to strike earmarks in spending bills through the amendment process. Beginning in 2005 or 2006, Rep. Flake, who referred to earmarks as the “currency of corruption,” offered several amendments targeting specific line items in spending bills that were requested by his colleagues. Of the 50 amendments with recorded votes in 2007 that were tracked by the Club for Growth, only one passed. The approved amendment offered by Rep. Flake targeted the $129,000 earmarked for the “Perfect Christmas Tree Project.” The earmark was requested by Rep. Patrick McHenry (R-N.C.), who was put in the awkward position of defending pork after criticizing his Democratic colleagues’ earmarks. The amendment to strike the earmark sponsored by Rep. McHenry, who now serves as deputy whip of the House Republican Conference, was approved by a vote of 249 to 174. Eventually, facing increased criticism over earmarks, Congress passed the Federal Funding Accountability and Transparency Act. The bill heightened transparency of federal spending, including federal contracts and grants, requiring that any outlay of $25,000 or more to any entity would be posted in a searchable, publicly available database that would include the name of the entity receiving the award, the amount, and the location of the recipient. In 2007, the website, USASpending.gov, went online. After Democrats took control of the House in January 2007, new processes were adopted as part of the rules package for the new Congress to make the earmarks more transparent. Members were required to disclose earmarks requests, including the recipient or location and the purpose. Members were also obligated to certify that they and their spouses had no financial interest in requested earmarks. The reforms were good for transparency, and there was a decline in the number and dollar amount of approved earmarks in 2007 not seen since 1999. But there was a concern that the reforms would not lead to a reduction in earmarks. Tax and budget expert Stephen Slivinski’s observations were prescient. Indeed, after the decline in 2007, the number of earmarks dramatically increased to 2004 levels in 2008. Of course, the reforms were not enough. Over time, as public attention increased and outcry grew louder, many members of Congress swore off earmarks. Other steps, including public disclosure of sponsored earmarks on each members’ congressional website and a ban on earmarks for for-profit entities, was approved by the House. Senate Republicans eventually followed suit with a moratorium of their own. The respective moratoriums have been continued since Republicans took control of the House in 2011 and the Senate in 2015, but not without criticism. As gridlock has increased, more members and pundits have urged Congress to restart the practice as a means to “grease the skids” on legislation. Previous attempts inside the House Republican Conference to end the moratorium failed. At least until now. Members who make such arguments also ignore Madison’s veto of the Bonus Bill of 1817. Although no specific projects were named or earmarked, the bill used additional revenues from the Second Bank of the United States for internal improvements, such as roads and canals. Madison’s primary reason for vetoing the bill was the “insuperable difficulty” he found “in reconciling the bill with the Constitution of the United States.” He dissected claims supporters of the Bonus Bill made about its constitutionality, argument by argument. Another common refrain from congressional supporters is that the practice makes the passage of appropriations bills easier to pass. On the surface, the argument may make sense, and some members who would have otherwise opposed a spending bill may be easily bought off with the inclusion of a sought after pork project. But those who are claiming that earmarking will be brought back on a limited basis have failed to learn the lessons of history and are making the same mistakes all over again. Especially in today’s toxic political atmosphere, the actual monetary cost of bringing back earmarks to trade for votes may indeed be high, as congressional campaigns have become increasingly nationalized. Even if successful at securing special funding for members’ districts, earmarks may not even serve the desired political purpose. The belief that “all politics is local” is becoming an antiquated view. A Democratic member may not be so inclined to vote for a conservative-leaning or potentially controversial appropriations bill only because he or she is getting an earmark funded because of the fear of backlash from the party’s base. Some members have said that earmarks may come back in a limited fashion. One legislative proposal introduced by Rep. Tom Rooney (R-Fla.) would allow earmarks for projects under the jurisdiction of the Army Corps of Engineers and Bureau of Reclamation. This represents a mission creep. These earmarks would return and, over time, more changes would be made, either in the House rules or by way of conference rule changes, to allow for more earmarks. Moreover, Republicans must put the prospect of short-term gains aside and think about the long term ramifications of restoring even some earmarks. Even if earmarks return in only a limited capacity, the next Democratic majority may restore the practice entirely. Of course, a complete restoration of the practice is certainly the desired end of many Republicans. Although a limited restoration is currently being considered, the political expediency of a complete return under a Democratic majority would give Republicans a political talking point. Finally, a talking point often used by Republican supporters of earmarks is that even at the peak of the practice, it represented a fraction of all federal spending. This is an argument that actually plays into the hands of those who oppose earmarks precisely because of concerns about government spending. There is no denying that the United States faces serious long-term fiscal challenges. Over the next ten years, the budget deficit is projected to rise from $563 billion in 2018 to $1.463 trillion in 2027 -- $10.112 trillion over the budget window. The percentage of the debt held by the public will rise from 78 percent ($15.537 trillion) to 91.2 percent ($25.524 trillion). Past the ten-year budget window, the finances of the United States grow worse. If Republicans lack the political will to keep their promises and prohibit earmarks, the cost of which is relatively small in the larger picture of federal spending, how will they find the political will to reform federal entitlement programs that are the drivers of federal spending? Bringing back earmarks sends a message to conservatives and libertarians that political expediency will almost always win, dimming the prospects for action to head of the fiscal crisis that faces the United States. On behalf of FreedomWorks’ activist community, I urge you to contact your representative and ask him or her to support the Merit Systems Protection Board Reauthorization Act, H.R. 6391, introduced by Rep. Jody Hice (R-Ga.). This legislation would appropriate funds to the Merit Systems Protection Board (MSPB) and make it easier to fire government employees for poor performance or misconduct while maintaining a fair review process.